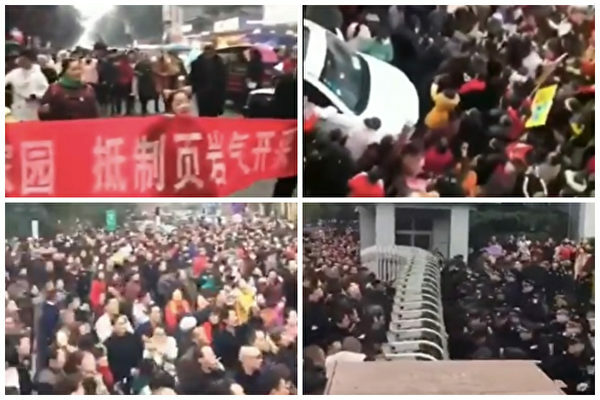 A decade after the devastating Wenchuan earthquake struck the southwestern Chinese province of Sichuan, locals in Rong County are protesting “earthquakes” that they believe are manmade. The quakes have caused at least four deaths and many injuries in the county, according to locals. Residents of Rong County blame the extraction of shale gas in the area for triggering the disasters. On Feb. 24, many people swarmed the streets in front of the county government offices to protest. The next day, about 10,000 protesters clashed with police, after which the county head announced that the shale project would be halted. China’s Earthquake Network Center recorded three earthquakes over magnitude 4 in Rong County over two days, including a magnitude 4.7 quake in the morning of Feb. 24 and two more on Feb. 25 of magnitudes 4.3 and 4.9. A local woman surnamed Chen told The Epoch Times that she had heard of at least four deaths in the area due to collapsing houses or objects, and that she herself was nearly crushed. Ms. Zhao, a villager in the township of Gaoshan, also said that there were four deaths in Rong County. She added that there was another death at a mine, but the authorities quickly seized the corpse for funeral and were suppressing information about the event. According to Mr. Li, he witnessed the deaths in Gaoshan, saying that two women had been killed by falling objects around 1 p.m. on Feb. 25, when the second earthquake struck. One of them had greeted him just minutes earlier. Locals believe that the local shale gas extraction industry is to blame for the tragedies. A local businesswoman surnamed Yu said that the mining had geological effects in the surrounding area. According to Ms. Wu, a local saleswoman, the ground stopped shaking for about 15 days during the Chinese New Year period, which began around Feb. 5—the day of the Chinese Lunar New Year—or the eve of the holiday. The earthquakes returned immediately after the holiday season ended. Much of the Rong County residents’ dissatisfaction with the situation has focused on the role of the local authorities in developing the shale gas industry. It is estimated that the shale gas reserves in Rong County are 5.18 trillion cubic meters, or about one-sixth of the total estimated shale gas reserves in China. On April 12, 2016, the Sichuan provincial authorities issued their “2016 Implementation Plan for the Development of Shale Gas Industry in Sichuan Province.” The plan aimed to produce 2.5 billion cubic meters per year in the province and set a target for Zigong City, which administers Rong County, to produce 500 million cubic meters per year by 2018. On Feb. 24, thousands of people held banners and took to the streets to protest. The next day, 10,000 gathered in front of the county government building. At some point during the demonstrations, protesters smashed the front gate. A number of people who took part in the protests were arrested, including children who damaged the gate to the government office. According to Ms. Wu, the saleswoman, the number of protesters increased even after arrests had been made. “The public is outraged,” she said.